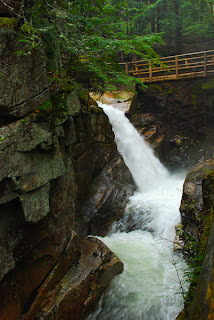 This is the Sabbaday Falls area off the Kancamagus Highway, better known as Rte. 112 in New Hampshire. The Kancamagus is famous for it's beautiful scenery all along it, as well as moose that seen quite often. The highway starts in Lincoln, NH and runs 26 miles to Conway, NH with many twists and turns as it follows the Pemigewasset River. Fall is this White Mountain area is spectacular.